It is known that Avocado (Persea americana) is vulnerable to viral, fungal, and bacterial infections, as well as disease due to nutrient deficiencies. The specimen pictured below is growing within a greenhouse that is air- temperature controlled above 40 degrees Fahrenheit. It was started from seed and is growing in an aquaponic system that is water temperature controlled at 64 degrees Fahrenheit. The livestock are a cold-water species. The water is not dosed with micro- or macro-nutrients. There are no necrotic spots indicative of infection. I would like a short list of most probable causes for this plant's disease based upon the parameters above. This plant needs some chemistry to be able to make its food/energy via photosynthesis. It is a dying and vulnerable plant right now. If there is a disease or insect problem it will be but secondary. This plant needs some chemistry. Others say nutrients...chemistry. Everything is chemistry. Healthy plants have to have chemistry to be healthy and vigorous and strong enough to resist damage by disease or insects. No micro and macro 'nutrients' or chemistry added is your problem. Easy to get confused with the mass of information over the internet and all the opinions of those that want to 'get back to nature'! Aquaponics can be a cool recycling of some chemistry. One needs to know the level of all chemistry before adding more because although adding none is a slow death adding a little bit too much is a quick death. If you aren't adding micro or macro 'nutrients' or chemistry to that water, this plant has no way to get Nitrogen, Phosphorus, Potassium, Calcium, Molybdenum, Boron, Iron, Silica, Sulfur, Manganese, Copper, Chlorine, Zinc!?? No plant could ever survive without these chemicals. All plants are different needing different amounts, different pH that greatly affects the chemistry. All plants we want to grow are dependent upon us completely. Plants make their own food. Photosynthesis requires all these chemicals in very very small amounts, without these chemicals plants start looking like yours. Your plant is unable to make its own food, thus it has no energy to maintain life and it is slowly dying. You are growing in water? Hydroponics even aquaponics requires additional chemistry added knowledgeably for any kind of success. Why the no 'dosing'? The use of that word tells me you might have chemistry misinformation? Food we eat is chemistry. Air we breathe is chemistry. We are individual bags of chemistry. No matter the medium of our gardens nor what type of crop we humans desire everything we touch will always be artificial and wholly dependent on us humans...our understanding of the web of life all those sciences. The more the gardener understands about the science nature has perfected, the better to reduce artificial input. Food to eat. As Richard P Feynman once told us, for any "why" there are reasons on reasons and underlying the reasons there are assumptions. Tackling the mechanical first, a leaf acts like a bimetal strip. This strip is two strips of different metals bonded together, each metal has a different coefficient of expansion. As the temperature rises one metal expands less than the other and so the strip bends; the faster one wants to expand more but can't because the other is holding it back. A leaf is like a bimetal strip, but temperature is only part of the story. The difference in surfaces is accounted for by stomata (air breathing/gas exchange pores) and the guard cells that control the opening of the pores. These guard cells are more numerous on the underside of the leaf. If something causes these to contract hard then the leaf has to curl since there is much more contraction on the underside than the top. If we look up the function of guard cells we find that they respond mostly to light. So that is the first thing on your short list, but probably not the most important since that deals with movement within a normal range, day/night standing orders. Dramatic curling indicates response outside the normal range. The rest of your short list comes from cell chemistry, and probably in no particular order. More information is required; you already have some suggestions. Not the answer you're looking for? Browse other questions tagged plant-health diseases avocado hydroponic aquaponic or ask your own question. 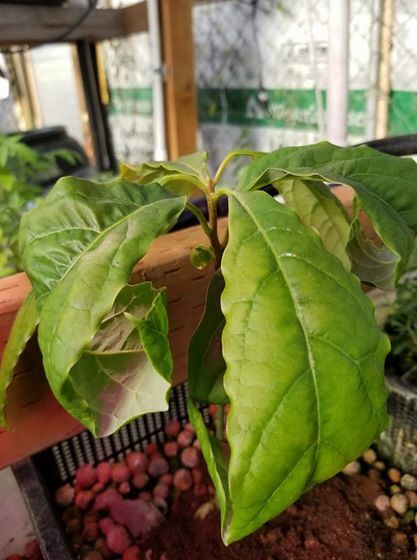 Why is the leaf on my avocado tree drooping?